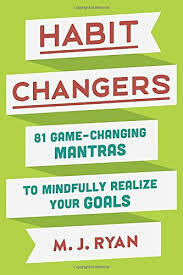 Most of us have things we want to change about ourselves or our daily lives, but we seem unable to break old habits. How many people do you hear say they want to lose weight, get a better job or get out of debt, yet they do nothing to achieve these goals? The book Habit Changers takes a look at some of the most common bad habits people need to overcome, and gives a short mantra or slogan that will be useful in achieving that result. The author, M.J. Ryan, has worked for many years as an "executive coach." Apparently this involves working with people in the business world with problems they need to overcome to be successful. Because of her extensive experience, she is able to give concrete examples of how some problems manifest themselves in the real world, and how she is able to advise her clients to resolve them. The idea of using "mantras" to overcome bad habits came about when Ryan was reading about Lojong, the Buddhist practice of repeating a slogan until it becomes so ingrained in your mind that you accept the idea without thinking about it. Because the new ideas are now part of your unconscious thought, you will be able to implement them without thinking. Ryan estimates it will take 6-9 months of repetition and awareness of your mantra for the permanent change to be made in your brain. She suggests not only repeating the mantra, but printing it out and putting it where it will be a constant reminder for you. The book is divided into sections for each category, followed by several sub-categories. Each sub-category has its own one-page explanation and example, including the relevant mantra. Some of the categories are Anger, Conflict, Procrastination and Self-Confidence. Sometimes the manta is the title of the category, such as "Change It, Leave It, or Accept It." While I enjoyed reading about the situations the author has encountered in working with business clients, I have a hard time believing the claim that after giving some of these people their new mantra, the "transformation was instantaneous and astonishing." Were that it were that easy! Still, if someone is truly committed to changing or improving an area of his or her life, being able to reduce the solution to a one-sentence slogan may help to put things into perspective.